Sometimes coming up with a new idea just means revisiting an old idea with fresh eyes. 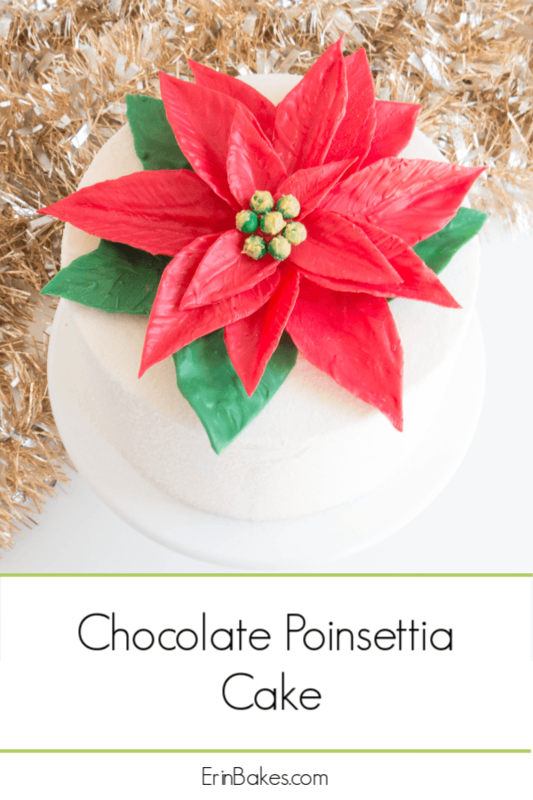 Back in 2014 I shared a normal-sized chocolate poinsettia on The Cake Blog. 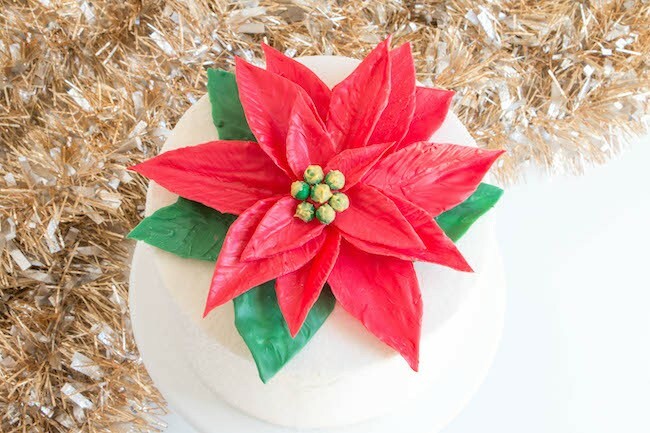 While I was scrolling through ideas from years past brainstorming what to make this year, I noticed an image of that cake next to an image from my giant chocolate cake flower tutorial, also shared on The Cake Blog a few years ago. Just like that l had a chocolate-in-the-peanut-butter moment. I should combine these two ideas! 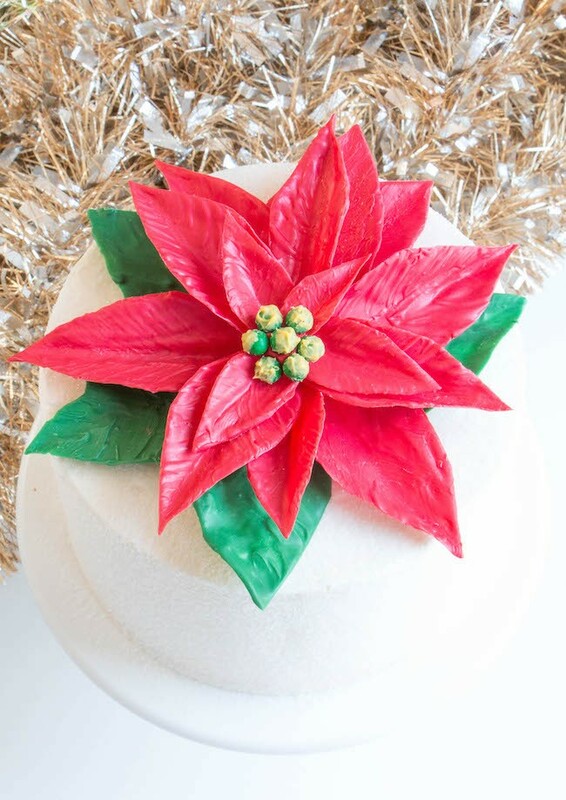 Why not make a giant poinsettia?! 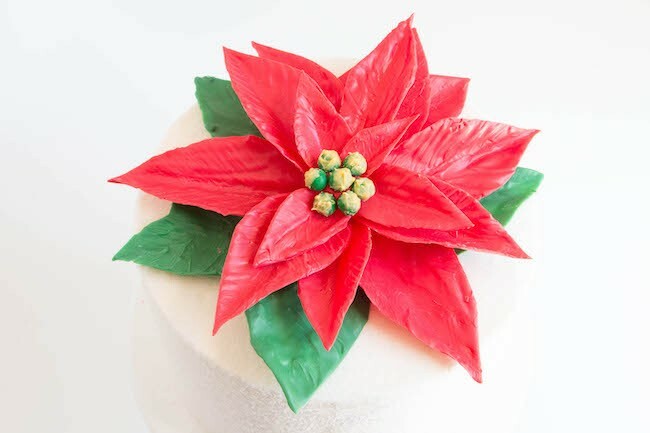 I must say, I try to love all my babies equally, but this larger version of a chocolate poinsettia is just SO much fun! 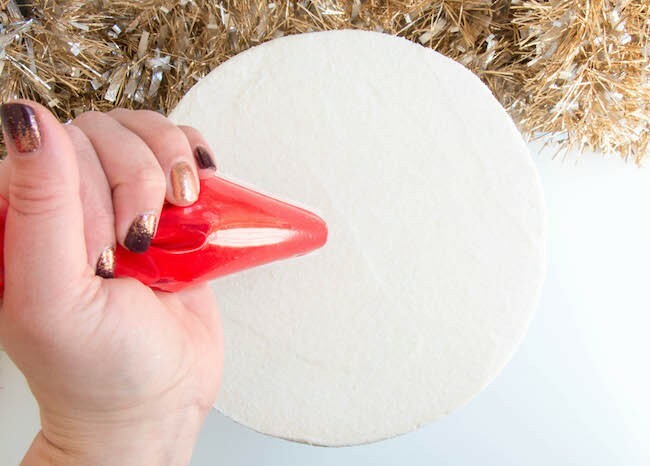 It’s not complicated to make; possibly even easier than the small version. I’m certain that this cake will make jaws drop when it shows up on your holiday dessert table. 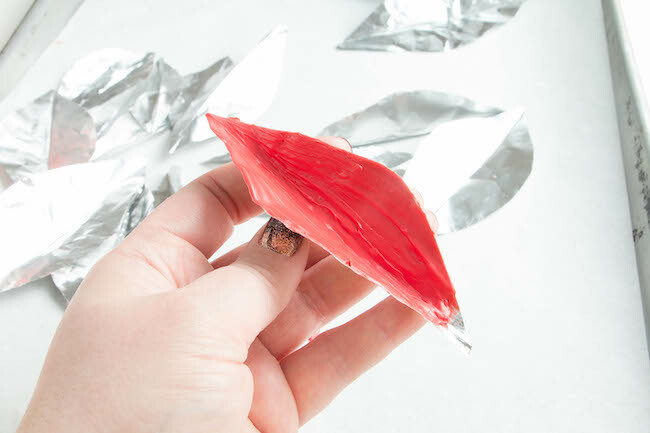 Tear off a few 3-inch wide strips of heavy duty aluminum foil. 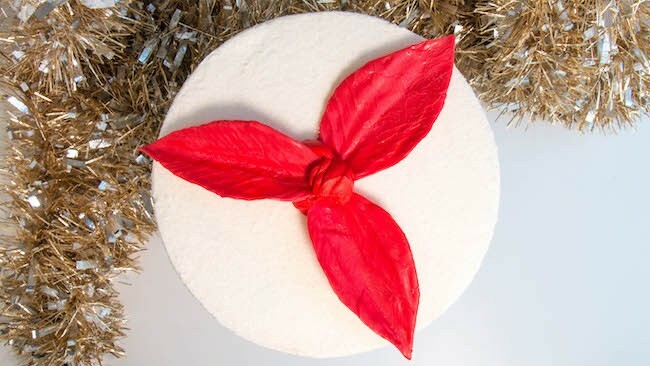 Cut from the foil 10-12 large leaf shapes no longer than half the diameter of your cake. I’m working on an 8-inch round, so I cut the leaves to be about 3 1/2 inches long and 2-inches or so wide. Cut another 4-5 small leaves about half as long and wide. Like me, poinsettias are very forgiving when it comes to exact lengths and dimensions. 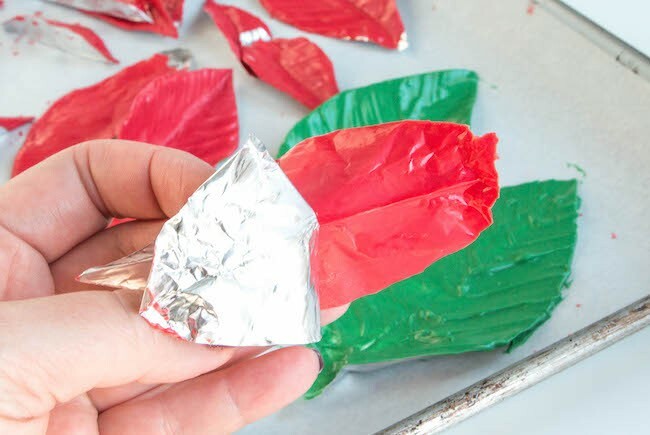 Fold each of the foil leaves in half, point to point, to crease the foil then open them back up. Set aside 3-4 of the large leaf forms. Melt the red coating chocolate in a heatproof bowl. Hold a leaf form by one of the points with the open crease facing you. 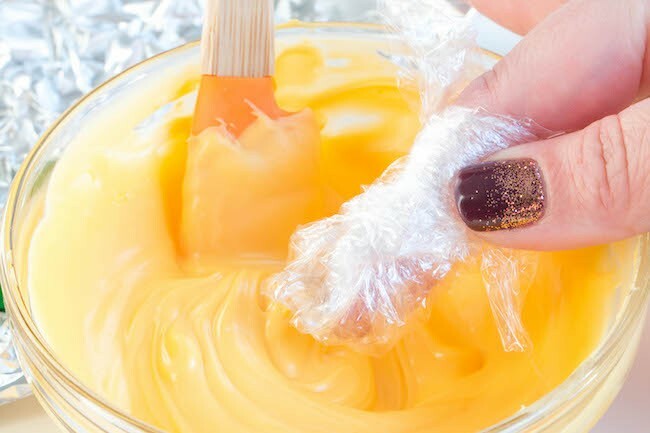 Brush the form with a layer of melted chocolate. 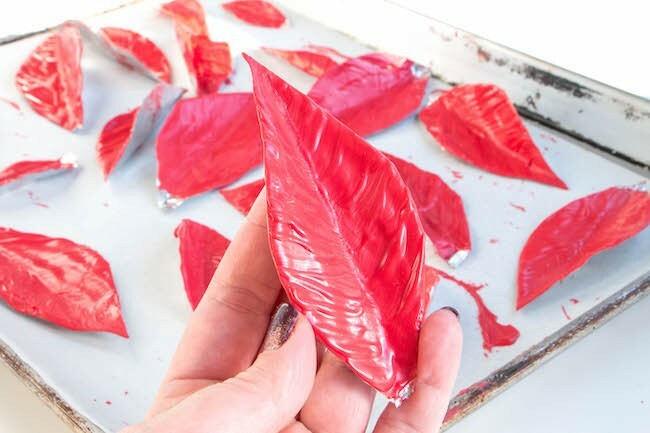 Set the leaf down on a cookie sheet to dry, about 10 minutes. Pop it in the fridge to speed the process up. Repeat with the rest of the leaf forms. Melt the green coating chocolate in a heatproof bowl. 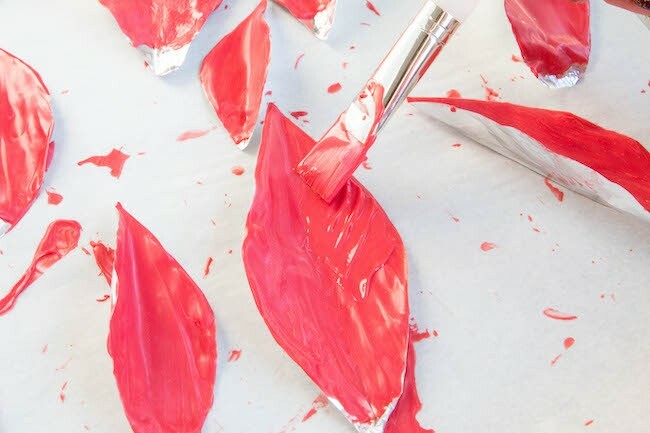 Repeat the same process to coat the 3-4 large leaf forms you set aside earlier. 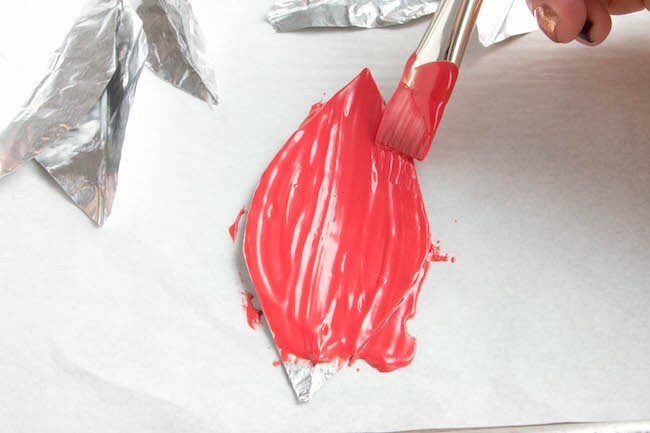 Go back in with your small paint brush and add a lighter layer of coating chocolate to each of the leaves. 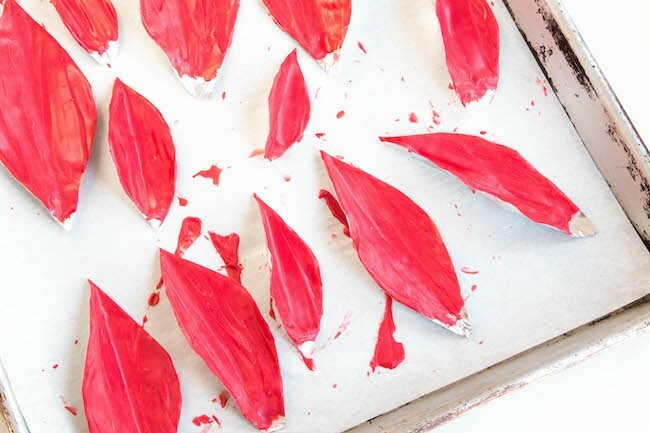 This time, be deliberate with the direction of your brush and spread the chocolate out from the center of each leaf towards the edges. This will help to strengthen your leaves and also add dimension. 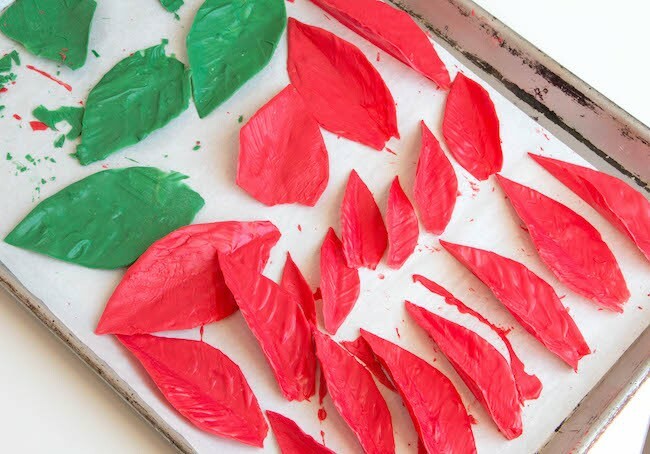 Allow the leaves to dry fully, another 10 minutes, before using. 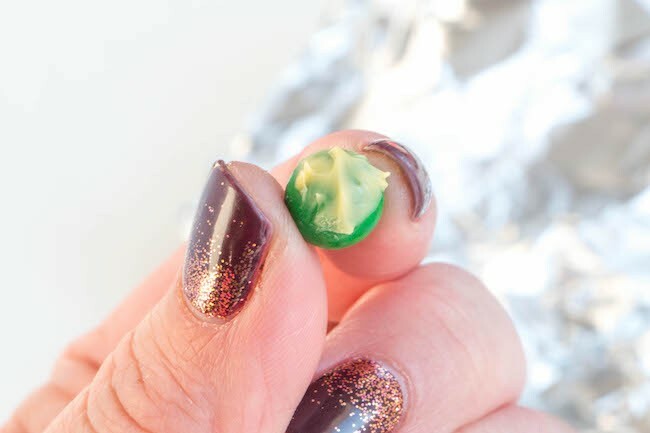 Crumple a piece of foil and open it back up again. 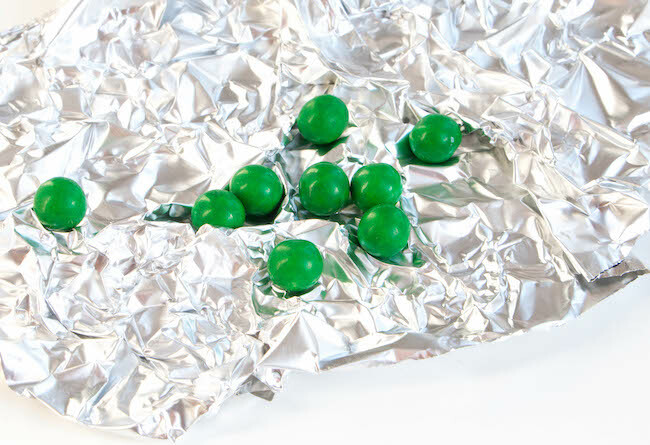 Set the Sixlets in the foil to steady them. Melt the yellow coating chocolate in a small heatproof bowl. 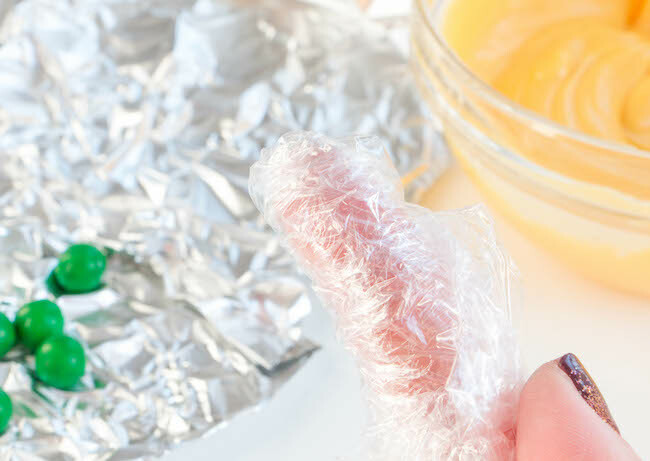 Wrap your pointer finger in plastic wrap. Dip the tip of your wrapped finger into the melted coating chocolate and tap the chocolate onto the surface of a Sixlet. The effect should be dappled and spotty, not evenly coated. Repeat with the remaining candies and set them aside to dry, less than 5 minutes. 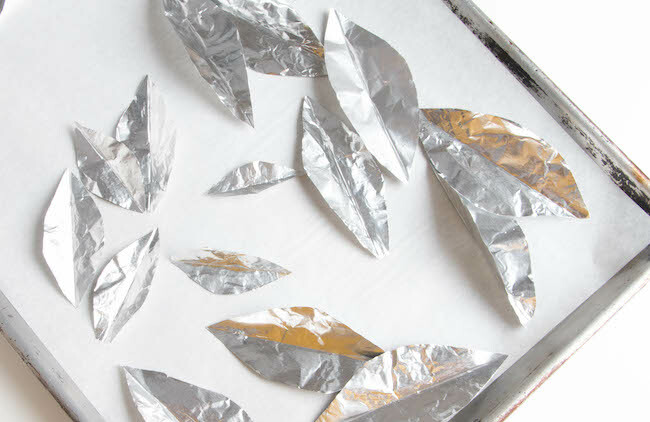 Carefully peel the foil backings off of each of the leaves. This works best on cold leaves straight from the fridge. Repair any broken leaves by gluing them back together with a little melted coating chocolate. Pipe a small mound of red buttercream (about the size of an egg) onto the center of the cake. Add the green leaves to the cake first. Layer on the red leaves starting with the larger ones and building up with the smaller ones. Add more buttercream to adhere the leaves as needed. 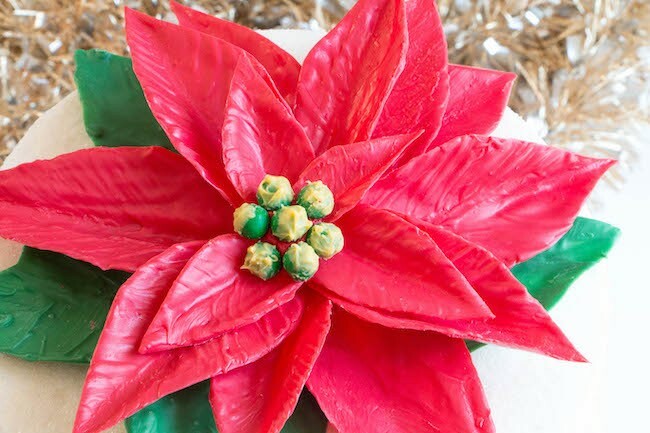 Finish the poinsettia by adding the Sixlet flowers to the center of the leaves.